Earthquake Kills Woman, Damages Buildings On Greek Island : The Two-Way The mayor said the island looked like it was "flattened by bombs." The magnitude 6.3 earthquake hit Monday afternoon off the coast of Lesbos in the Mediterranean Sea. Debris from a damaged building after an earthquake in the village of Plomari on the northeastern Greek island of Lesbos on Monday. A powerful earthquake Monday afternoon killed a woman and damaged buildings on the Greek island of Lesbos, according to the mayor. The earthquake, magnitude 6.3, was centered south of Lesbos in the Mediterranean Sea, according to the U.S. Geological Survey. Shaking was also detected in nearby Turkey and on the Greek mainland. 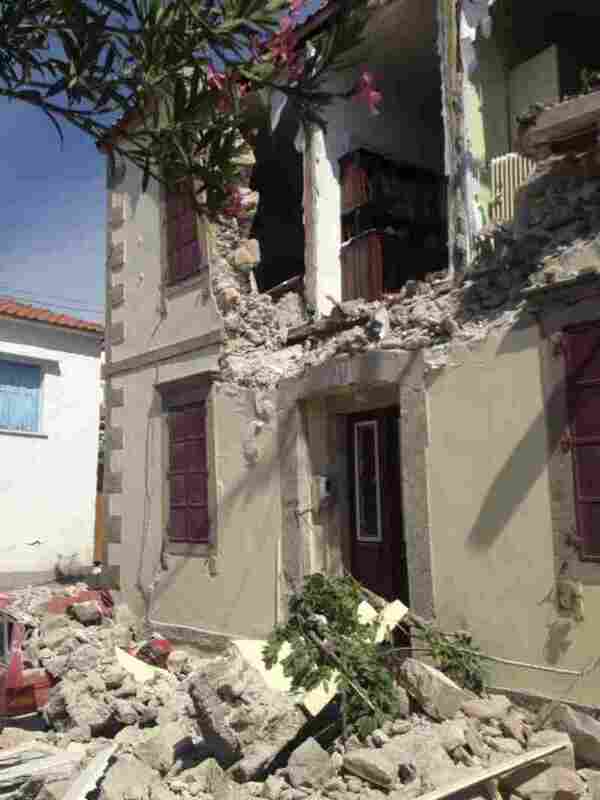 "Most of the houses in the village of Vrissa ... have been badly damaged by the earthquake," Lesbos Mayor Spyros Galinos wrote. According to the BBC, he told local media that it looked like the village had been "flattened by bombs." A woman from the village was "found dead after her house collapsed because of the earthquake," Galinos said. "I'm so sorry." Ten other people were injured in Vrissa as a result of the quake, The Associated Press reported. The mayor said that rescue workers were able to pull a woman alive out of a collapsed house and transport her to the hospital. Residents who are unable to stay in their houses are being transported to temporary housing on a football field in nearby Polichnithos, the mayor added. The island has been at the center of Europe's refugee crisis, with thousands arriving on its shores from Turkey. "There was no reported damage or injuries at refugee camps on Lesbos or the nearby island of Chios," AP reported. "About 8,000 [migrants] remain in limbo in Lesbos and Chios as they await news on their asylum applications." 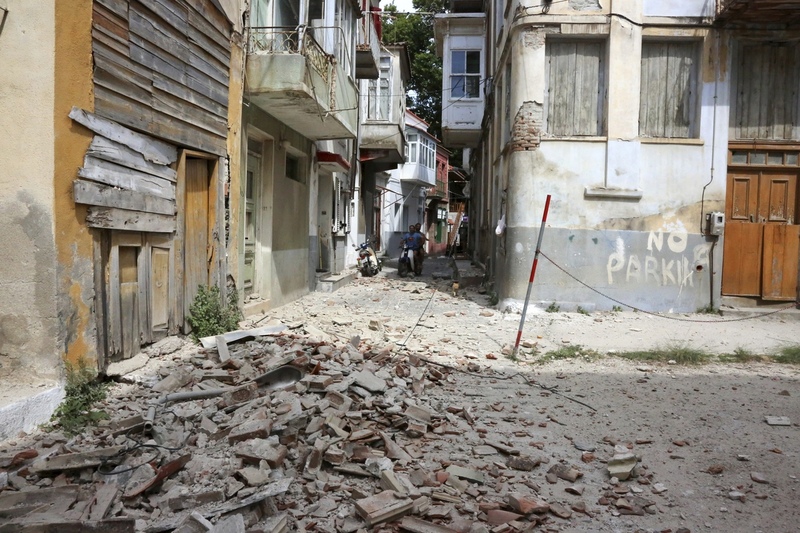 The quake was also felt in the Turkish coastal city of Izmir, though no casualties were reported, according to the state-run news agency Anadolu. "The trembling was really bad. Everything in my clinic started shaking wildly; we all ran outside with the patients," Didem Eris, a 50-year-old dentist in Izmir, told Reuters. "We are very used to earthquakes as people of Izmir but this one was different. I thought to myself that this time we were going to die." Earthquakes are common in Greece and Turkey, and the U.S. Geological Survey concluded that this one "occurred as a result of normal faulting in the shallow crust."